Displaying a mountains done in a beadwork band across the back of the hand, these dark brown leather gloves are named for Mount Antero. Located in Colorado, Mount Antero is the highest summit of the southern Sawatch Range of the Rocky Mountains of North America. The prominent 14,276 foot fourteener rises above the San Isabel National Forest. 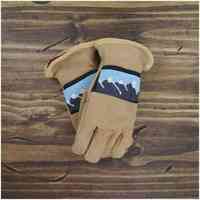 Astis leather mittens are hand-sewn in the USA from light tan high-quality suede leather with hand-stitched beadwork on the gauntlet and are lined with Polartec Thermal Pro High Loft insulation. Working directly with a tannery in the USA, we developed a suede leather, injected with silicone during the tanning process for further waterproofing, that is extremely durable yet retains great dexterity. The length and cut of their design allows for a jacket to slide fully inside without bunching while providing a close fit that protects the wrists and hands from snow in the heaviest of powder days.